Imagine a gift wrapped in paper you really do treasure and want to carefully fold and save. That's because the wrapping paper lights up with words like "Happy Birthday" or "Happy Holidays," thanks to a built in battery -- an amazing battery made out of paper. That's one potential application of a new battery made of cellulose, the stuff of paper, being described in the October 14 issue of ACS' Nano Letters. Albert Mihranyan and colleagues note in the report that scientists are trying to develop light, ecofriendly, inexpensive batteries consisting entirely of nonmetal parts. The most promising materials include so-called conductive polymers or "plastic electronics." 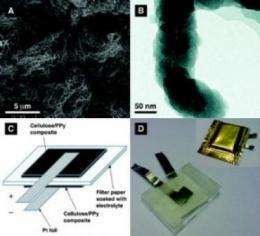 One conductive polymer, polypyrrole (PPy), shows promise, but was often regarded as too inefficient for commercial batteries. The scientists realized, however, that by coating PPy on a large surface area substrate and carefully tailoring the thickness of the PPy coating, both the charging capacity and the charging (discharging) rates can be drastically improved. The secret behind the performance of this battery is the presence of the homogeneous, uninterrupted, nano-thin coating — about 1/50,000th the thickness of a human hair — of PPy on individual cellulose fibers which in turn can be molded into paper sheets of exceptionally high internal porosity. It was special cellulose, extracted from a certain species of green algae, with 100 times the surface area of cellulose found in paper. That surface area was key to allowing the new device to hold and discharge electricity very efficiently. The innovative design of the battery cell was surprisingly simple yet very elegant since both of the electrodes consist of identical pieces of the composite paper separated by an ordinary filter paper soaked with sodium chloride serving as the electrolyte. The potential difference is solely due to differences between the oxidized and reduced forms of the functional PPy layer. The battery recharged faster than conventional rechargeable batteries and appears well-suited for applications involving flexible electronics, such as clothing and packaging, the scientists say. Alternatively, low-cost very large energy storage devices having electrodes of several square yards in size could potentially be made in the future.